The prestigious European Tax Awards of the international Tax Review recognise the leading tax professionals around Europe. bpv Huegel tax practice is named “Austria Transfer Pricing Firm of the Year”. Vienna/Moedling/London, Mai 2018. The European Tax Awards have taken place annually since 2005 and seek to recognize the leading international tax professionals from around Europe. bpv Huegel wins as “Austria Transfer Pricing Firm of the Year” at the prestigious International Tax Review’s European Tax Awards 2018. The Awards are recognised as a benchmark in the European tax services sector. The firms are judged on key criteria such as size, innovation and complexity of their transactions. “Thanks to our tax team for their hard work and commitment over the last years which makes our tax practice so unique. The award for transfer pricing also confirms our strategy to provide the complete range of tax services”, highlights Gerald Schachner, head of the tax practice. The exceptional success of the tax practice group this year is further proven by nominations in not less than five award categories. In addition to the “Austria Transfer Pricing Firm of the Year” bpv Huegel was nominated as “Austrian Tax Firm of the Year” for the fourth time in a row, and the firm’s work for Raiffeisen Zentralbank Österreich on its merger with listed Raiffeisen Bank International earns nominations in even three deal categories as “European Banking Tax Deal of the Year”, “European Restructuring Deal of the Year” as well “European Capital Markets Tax Deal of the Year”. 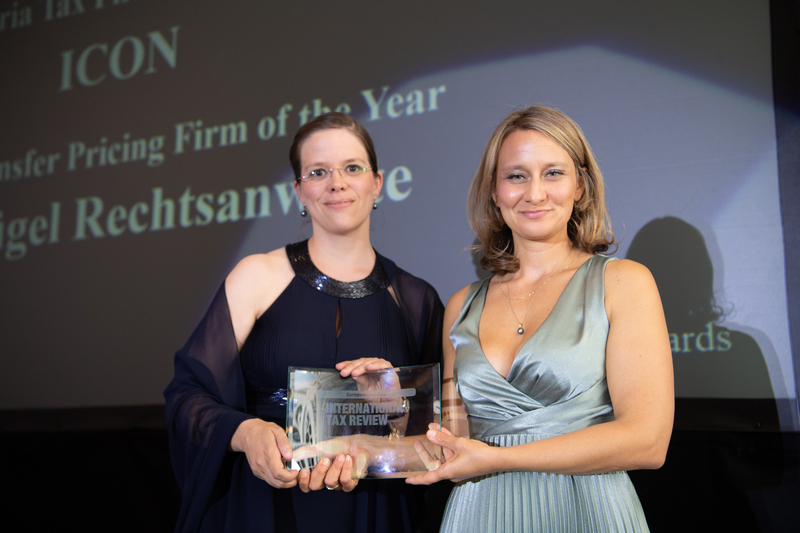 The shortlists for the jurisdiction categories comprise leading Austrian and international law firms and tax consultancy firms. Together with bpv Huegel the tax practice of Deloitte, Freshfields, ICON, TPA and Rödl&Partner are shortlisted. In the deal categories the competition is extended all over the European premier league firms with European top deals. The International Tax Review is a UK based publisher that provides tax professionals in industry, government, private companies and research a multi-media source of intelligence on key areas in tax. Kornelia Wittmann (left), Attorney at Law/Tax Adviser at bpv Huegel, at the Awards held at the Hotel Savoy, London.